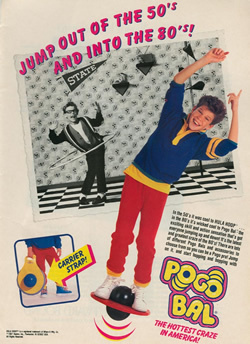 I had a Pogo Bal. And it didn't just sit in the garage and collect dust either. I was a Pogo Bal pro. 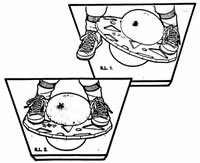 The idea behind the Pogo Bal was simple -- step on with one foot, step on with the other, squeeze the top ball between your feet, and jump. Intended to be the 80's answer to the pogo stick, most Pogo Bal's found themselves doomed to a life rotting in the backyard grass. Not mine, boy. 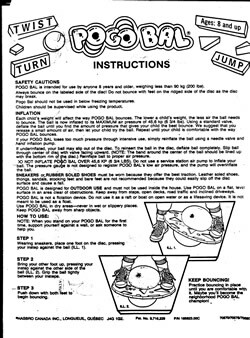 I remember one particular rainy day -- it may have even been the day I got my Pogo Bal -- when I spent so much time practicing that I wound up with blisters on the insides of my feet (For the record, Pogo Bal use is much eaiser with bare feet). I want to say my consecutive jump count on this day found itself well over 500. Pogo Bal's were available in many different color combinations -- mine was orange with a yellow platform. Based on many of the pictures I have seen of Pogo Bals, I think mine may have been consistently underinflated. Either that, or put together backwards. While most pictures show the upper ball as being slightly larger than the lower, mine were the other way around. At the very least, they were equal in size. Either way, I was a Pogo Bal champ.